I'm currently writing a plugin for Jad and I'm looking for any suggestions or issues that people have with the existing Jad plugin. My starting point for this was having to decompile into an existing source path directory, and from there I've added a bunch of fine-grained control functionality such as always/ask/never decompilation at the global/package level and decompile to memory. Further suggestions are welcomed. non-fatal errors to be suppressed. Looking forward to using your plugin! Output is now in a tool window, with a toggle to clear and close automatically if the decompilation was successful. Awesome. When will it be available? automatically if the decompilation was successful. Still got some issues to iron out before it's in a decent state, so next week at the earliest. I may do a an early release on sunday just to get some feedback. At the moment i'm running it in memory-decompilation mode, so it transparently decompiles classes as it hits them - it's pretty nice to work with. Haven't written the to-disk decompilation yet but that's a very small task. Glad the feedback was of some use. At the moment i'm running it in memory-decompilation mode, so it transparently decompiles classes as it hits them - it's pretty nice to work with. To be honest in memory decompilation is all I want! What would be shockingly cool is if you could output a decompilation of a currently selected class as a separate "backing" pane in the editor. This would be like the "HTML Preview" tab on HTML files, but would instead be a "Jad decompilation" tab available in addition to the "signature-only" decompilation done by IDEA. Look at classes PerspectiveFileEditor and PerspectiveFileEditorProvider to see how this could be done. Much nicer than a tool-window. the editor as per the old plugin. Is this correct Steve? this could be done. Much nicer than a tool-window. 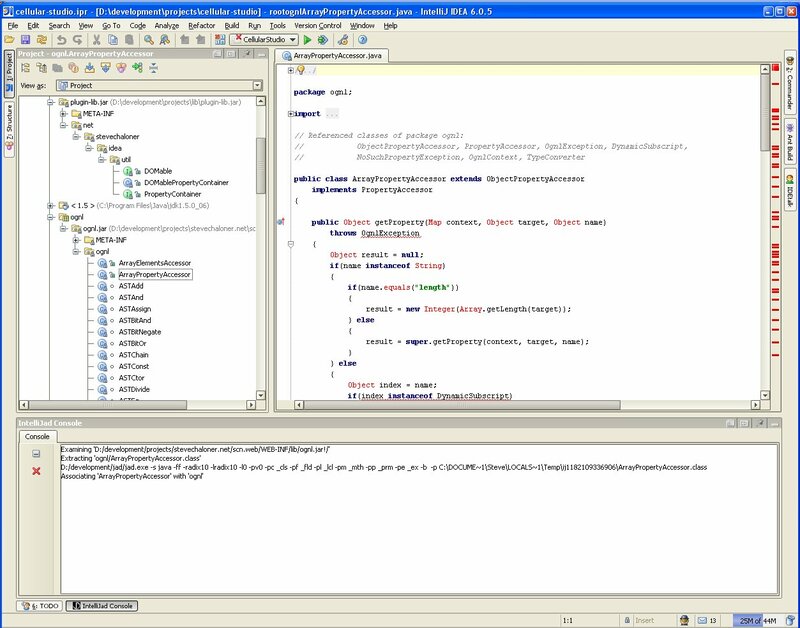 b) if the decompilation is unsuccessful (success being defined by Jad, not the IntelliJad) the class file editor will remain open. A screenshot is attached to give a better idea. As for leaving the class file open even if the decompilation was successful - I can make that an option. I emailed Jetbrains at the weekend to ask if they can give a heads-up on the competition dates but as yet, nothing. Guess we'll know when we know. does the explanation/screenshot below meet what you suggested, or do you have something else you'd like to see?